Why Safire is an artist . 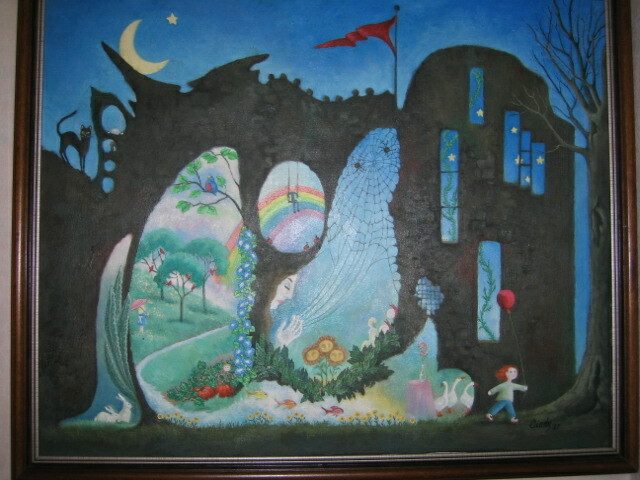 . .
My mother painted this when I was eight or nine. If the lady with spiderwebs trailing from her fingertips looks familiar, it’s because I used the charcoal study of this painting to make the cover for Tapestry Lion. All of my book covers are from paintings or pastels or charcoal sketches that my mother did–it’s one way I have of sharing her memory with other people who might never know of her otherwise. She was quite a talented lady — and a wonderful mom. One of Mom’s best friends (who had this painting in safe keeping for the last twenty years) just gave this to me, and I can’t thank her enough–I can’t imagine a more meaningful gift. I remember Mom telling me the story behind this painting. When she was a little girl, she used to rollerskate by this old, crumbling mansion, haunted in a way only abandoned houses can be. She would always skate a little faster when she went by this house, even as she tried to look through the windows, that wonderful shivery fascination I imagine many of us feel when confronted by something that scares us, yet intrigues us at the same time. I can’t remember a time when art wasn’t a part of my life. One of the first ways Mom devised for me to entertain myself was handing me a crayon and telling me to draw. Or she would hand me one of her many art books. My favorite of these was Michael Whelan’s Works of Wonder. If you’ve read fantasy or sci-fi in the last thirty years or so, you’ve probably seen Michael Whelan’s amazing cover art. His work is incredibly detailed and realistic, yet fantastical at the same time. I always expected his renderings of Anne McCaffrey’s dragons to fly off the page and into my world. I never got the chance to tell Mom how much her example influenced Safire’s artistic side. Or how much her example made me fall in love with fantasy before I could barely talk. If not for Mom, I don’t think I would be a writer. Certainly not a writer of fantasy novels. Mom and Dad always encouraged my creativity, even when it didn’t quite mesh with their view of the world, and for that, I am eternally grateful. I can’t imagine life without some creative outlet. Mom didn’t quite know what to think of early versions of The Witch Awakening. When she first read some of it, she looked at me and said “Karen, this is rather dark. And I think Safire needs a pet” which is why I describe my writing as gothic and how Safire’s horse Strawberry came to be. I think Mom would approve of me using her art on the covers, perhaps even be proud. I hope so. A couple years ago, I dreamt that I could call heaven and talk to Mom on the phone. I remember asking her if God let her embroider and draw in heaven, and she replied yes. So now every time I see a beautiful sunset, I think of Mom and Dad and all the other artists up in heaven, having some fun with God’s pastels.